Narang, V., Kaur, H., Kaur Selhi, P., Sood, N., Singh, A. (2016). Preanalytical Errors in Hematology Laboratory- an Avoidable Incompetence. Iranian Journal of Pathology, 11(2), 151-154. Vikram Narang; Harsimran Kaur; Pavneet Kaur Selhi; Neena Sood; Aminder Singh. "Preanalytical Errors in Hematology Laboratory- an Avoidable Incompetence". 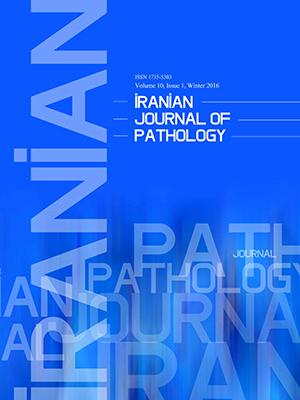 Iranian Journal of Pathology, 11, 2, 2016, 151-154. Narang, V., Kaur, H., Kaur Selhi, P., Sood, N., Singh, A. (2016). 'Preanalytical Errors in Hematology Laboratory- an Avoidable Incompetence', Iranian Journal of Pathology, 11(2), pp. 151-154. Narang, V., Kaur, H., Kaur Selhi, P., Sood, N., Singh, A. Preanalytical Errors in Hematology Laboratory- an Avoidable Incompetence. Iranian Journal of Pathology, 2016; 11(2): 151-154. Background: Quality assurance in the hematology laboratory is a must to ensure laboratory users of reliable test results with high degree of precision and accuracy. Even after so many advances in hematology laboratory practice, pre-analytical errors remain a challenge for practicing pathologists. This study was undertaken with an objective to evaluate the types and frequency of preanalytical errors in hematology laboratory of our center. Methods: All the samples received in the Hematology Laboratory of Dayanand Medical College and Hospital, Ludhiana, India over a period of one year (July 2013-July 2014) were included in the study and preanalytical variables like clotted samples, quantity not sufficient, wrong sample, without label, wrong label were studied. Results: Of 471,006 samples received in the laboratory, preanalytical errors, as per the above mentioned categories was found in 1802 samples. The most common error was clotted samples (1332 samples, 0.28% of the total samples) followed by quantity not sufficient (328 sample, 0.06%), wrong sample (96 samples, 0.02%), without label (24 samples, 0.005%) and wrong label (22 samples, 0.005%) Conclusion: Preanalytical errors are frequent in laboratories and can be corrected by regular analysis of the variables involved. Rectification can be done by regular education of the staff. Lundberg GD. How clinicians should use the diagnostic laboratory in a changing medical world. Clin Chim Acta 1999;280 (1-2):3–11. Laposata M, Dighe A. "Pre-pre" and "post-post" analytical error: high-incidence patient safety hazards involving the clinical laboratory. Clin Chem Lab Med 2007;45(6):712–719. Stroobants AK, Goldschmidt HM, Plebani M. Error budget calculations in laboratory medicine: linking the concepts of biological variation and allowable medical errors. Clin Chim Acta 2003;333(2):169–176. Plebani M. The detection and prevention of errors in laboratory medicine. Ann Clin Biochem 2010;47(Pt2):101–110. Ashavaid TF, Dandekar SP, Khodaiji S, Ansari MH, Singh AP. Influence of method of specimen collection on various preanalytical sample quality indicators in EDTA blood collected for cell counting. Ind J Clin Biochem 2009; 24(4):356-60. Uprity S, Upretity S, Bansal R, JeelaniN,Bharat V. Types and Frequency of preanalytical errors in hematology lab. J Clin Diag Res 2013;7(11):2491-93. Favaloro JE, Funk DM, Lippi G. Preanalytical variables in coagulation testing associated with diagnostic errors in hemostasis. Lab Med 2012 ; 43(2): 1-10. Hawkings R. Managing the pre and post analytical phases of the total testing process. Ann Lab Med 2012; 32:5-16. Chawla R, Goswami V, Tayal D, Mallika V. Identification of the types of preanalytical errors in the clinical chemistry laboratory: 1 year study of GB Pant Hospital. Lab Med 2010; 41: 89-92.